Today, Joyalukkas Group is a multi-billion dollar global conglomerate with its retail jewellery presence in 11 countries with 160 show- rooms spread across the world. Further, the group has diversified its business inter- ests into Money Exchange, Fashion & Silks, Real Estate and Malls. Considered a pioneer in the jewellery industry, Joy Alukkas is cred- ited for setting a trend in the jewellery market by introducing demographic specific designs across its presence and the one who took classic Indian jewellery designs to the global market. Joyalukkas Group is a multi-billion dollar global conglomerate with its retail jewellery presence in 11 countries with 160 showrooms spread across the world. The foundation for this fantastic journey was laid back 3 decades ago with the inception of its first jewellery outlet in Abu Dhabi in the year 1987. Remembering his early business days, Joy Alukkas said, “Venturing out of my comfort zone, I felt a hint of trepidation as I took my first flight to UAE. However, everything changed the moment I stepped in the UAE. All my skepticism cleared and a wave of positivity took over me. My intuition told me this is where it would all begin.” Years of his preparation under the tutelage of his father and knowledge of the jewellery market helped Joy Alukkas taste instant success, as the first business venture turned out to be profitable. In the same year, he opened another showroom in Dubai. The year 2000 proved to be a turning point for the brand Joyalukkas as the family business split. Joy Alukkas was handed the responsibility of the three outlets in the UAE. 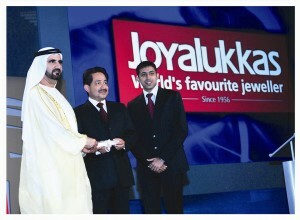 After the split, there was no looking back for Joyalukkas, as the company began to expand substantially, spreading its presence across the GCC and venturing to different countries, from England to the USA. When asked what makes Joyalukkas such a successful brand and synonymous with the precious yellow metal, Joy Alukkas said, “Success is a simple theory, earn the love and trust of the customer with relentless excellence and you shall succeed.” Joyalukkas adopted a three-pronged strategy of delivering Quality, Trust and Excellence to win the love of its patrons. Quality has been a constant at Joyalukkas and what further enhanced the value of the brand was its offering of over a million designs inspired from different culture and traditions across the world. Joyalukkas showrooms recreated an ambience of comfort and warmth along with superior service, which made the customers come back to Joyalukkas.